Please send us the artwork (graphics) you would like to have reproduced on your label. Original art/logo will be returned to you upon request. We have to scan what you send. While we can work from almost anything, the better your artwork the better your label. The best art is crisp, clear, "camera ready" black images on white paper (we cannot work from a photograph). please send us a second "clean" copy of your graphics. Make sure that there are no folds in the part of the paper that has your artwork. Please do not write on the rear of the artwork. Also, do not cut the artwork out of the paper. Please send us the whole sheet, it gives us a straight edge to line up your art in the scanner. artwork with screens (images made up of dots) do not print well. The best art is a line drawing with few details. We only print one color per label and cannot print grey tones. Remember, when we reduce your art to fit into the label, the fewer details in the artwork, the better it will print. Faxed artwork is not usable. The resolution is too poor and the image is distorted during the fax process. For glycerine soap orders, please select a color for the label (background) and an ink color for your print. 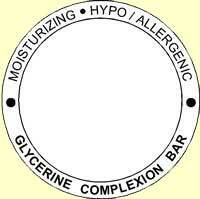 You may see sample label colors here for glycerine bar soaps. You may choose any background color and any color of ink. 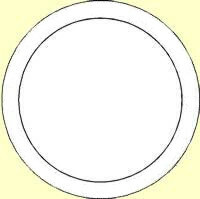 Also, it is helpful to draw a basic diagram of the label that you want. The outside of the label is 2 1/4"
The outside ring is 2 1/8"
The inside ring is 1 3/4"
for example: address, phone number, website, slogan, etc. If you know the name of the font(s) that you want, please include their name and a printed sample. Script fonts do not look good when they are curved. If your font is not on file with us, we may ask you to send us a copy of the font. They should be "True Type" fonts in PC format. Please note, the same suggestions that apply for mailed hardcopy artwork listed above also apply for artwork sent as computer files. If you are going to send us your artwork on disk, it must be in PC format (not MAC) on a floppy, Zip 100 or CD. Please have the name of your inn in the file name. The type of computer file should be a high-resolution "tif" file. Black images on a white background without any grays or shadows work the best. Files like "jpeg", "jpg" & "gif" are too poor of a resolution to be usable. They are image files designed for web pages, not graphics work. Files created by programs like Photo Shop, Illustrator, Corel and Word are not usually usable. We must have the same version of your program to be able to open the file. We must also have the same fonts loaded into our system. Tif image files work the best!